St. Brendan's and Trinity Milton met in the U8 Final. Hundreds of underage players and families from the New England region made the 460 mile journey westwards to Buffalo, NY to compete in the 2017 CYC tournament. It is the largest Gaelic sports youth tournament outside of Ireland, and took place from July 27 – 30 at the beautiful West Seneca Soccer Complex about 10 miles from downtown Buffalo. The fields were converted to facilitate Gaelic sports for the weekend, and with hundreds of games to play, featuring thousands of players from Canada to California, all 14 playing fields were needed. The event ran smoothly with the immaculate surfaces providing a lush carpet for the players, plenty of trees to provide shade from the sun, and water towers to keep players and coaches alike well hydrated throughout the day. 150 local volunteers ensured that the place was kept spotless and those who needed food (or drink) were not left waiting. Buses ran on time to ferry parents and participants to and from hotels. It was a massive credit to the local Buffalo GAA club to prepare for and run an event of this scale with hardly a hiccup. Ryan Nugent in action for St. Brendan's U8 Footballers. Kieran O'Driscoll in action for the U16 ISYL Hurlers. The Boston-Northeast region was well represented at the event and teams from the Irish Sports Youth League, St. Brendan’s, and Trinity Milton featured well. Between them the local clubs entered 20 teams from U8 to U18, and several players also featured on North American U16 and Minor County teams. Competition was stiff with some very strong teams from New York, Philadelphia, and San Francisco to face. Ten teams reached finals and there were 4 Cup winners and 6 runners up. 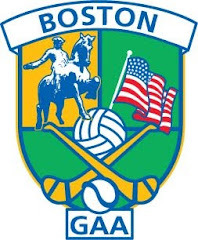 Both the U8A and U10A hurling finals were all Boston affairs. St. Brendan’s U8’s defeated Trinity Milton in the U8 final, while it was the ISYL U10s who came out victorious against St. Brendan’s. Winners also included the ISYL U14 Girls footballers and St. Brendan’s U8 footballers who each won their finals. Runner up plaques also went to U18B Footballers, U18 Camogie, U12A Hurling, U16A Hurling and U18A Hurling. ISYL, St. Brendan's, and Trinity in one Picture! North American County teams features several players from the ISYL. Winners were the U16 Boys football, U16 Girls football, and U18 hurlers, while the U16 hurlers shared the spoils with New York after the final finished in a draw. Aidan Joyce won the Player of the Game award for his performance in goal for the North American team. Players who featured on the county teams were, U16 Football: John O'Doherty, Colm O'Malley, Gerard Davoren, Michael Kerr, Peter Bannon, Dylan Coyne, Kieran O'Driscoll, Stephen Joyce. Matt Duane, Gerard Gannon, Eoin Gormley. U16 Hurling: John O'Doherty, Colm O'Malley, Gerard Davoren, Michael Kerr, Peter Bannon, Dylan Coyne, Kieran O'Driscoll, Stephen Joyce. Matt Duane. U16 Girls: Aine Doyle, Aoife Delaney, Ciara Heffernan. U18 Girls: Emma Lynch, Roisin Bannon. U18 Hurling: Aidan Joyce, Tomas Griffin & Michael Moylan. U18 Football: Denis Harrington, Tomas Griffin, Aidan Joyce, Michael Moylan, Sean Winston. Next year is the turn of the Boston division to host the tournament. Buffalo leaves us with a hard act to follow, but with some experienced hands at the wheel it is one that is sure to be met.